Schultz J. A mutual admiration society. Sci Ed 2019;42:2-3. “Red Admirable” plate from Morris Harris’ The Aurelian (1766). I think this is especially true for scientific editing and publishing, where we are forever reliant on multiple parties (authors, reviewers, other editors, vendors, etc) all working together, usually on a deadline or tight schedule, in a way that can be maddening if any part of this is even the slightest bit off and you don’t have the right perspective. Get involved in your professional Society. Don’t just join, commit to it. Volunteer for a committee, network, meet people, and don’t be shy about asking advice. One of the elements I like about this profession is there is always something new to learn: some new innovation, new initiative, or new development. 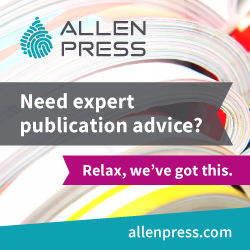 Of course, this can also become a bit overwhelming, which brings us to our final piece of advice from Beth Staehle (Director of Publications for the Biophysical Society): “Get involved in your professional Society. Don’t just join, commit to it. Volunteer for a committee, network, meet people, and don’t be shy about asking advice. When I fell into this career, I was very lucky. I actually had some mentoring, took some basic editing classes, read books, attended seminars, and learned from the ground up. But I didn’t take the time to build a broad network and always felt that everyone else had all the answers… I was afraid of being embarrassed about not knowing something. Now, late in my career I have a small network of colleagues I use as my ‘sounding board’ but I would do it differently if I had it to do again.” All I have to add to this excellent advice is that contributing an article to Science Editor is another great way to get involved. 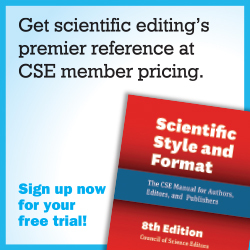 This call to action makes for a perfect transition to discuss the focus of many of the articles in this issue of Science Editor: The Council of Science Editors (CSE) and our upcoming annual meeting (May 4–7, 2019 in Columbus, Ohio). As I noted in a recent Newsletter, I find the CSE annual meeting to be an invigorating experience, charging my professional batteries for the rest of the year. At each CSE annual meeting, hundreds of professionals interested in advancing and improving scientific editing and publishing gather to share experiences and innovations, discuss best practices and tough challenges, and share thoughts on where we’re heading and how best to get there. This issue includes a sneak peak of the program co-chairs Mary Billingsley and Shari Leventhal have orchestrated for the meeting along with the preview (by Nancy Devaux) of the Short Courses being offered. 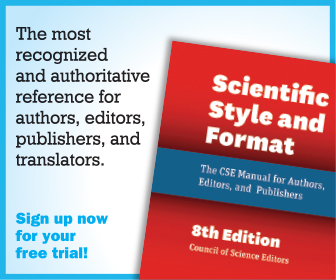 The theme of this year’s meeting, The Spirit of Scientific Publishing: Inclusion, Identity, Technology, & Beyond, is further reflected in the newly adopted CSE Code of Conduct and the accompanying commentary by Dana Compton, who spearheaded its creation. As she notes, “this Code is intended to align CSE’s values and commitment to diversity and inclusivity with its stated purpose of fostering networking, education, discussion, and exchange.” She further explains that the new Code is not simply a call to be “respectful despite our differences, but [to] explore those differences to better understand each other and forge new relationships.” That we are stronger when we work together then when we toil apart has become a cliché of team building exercises and political campaigns across the spectrum, but it doesn’t stop it from being true. Expanding on this idea, Eugenia Zuroski, Suzanne Kettley, and Patricia Baskin provide an introduction to the Coalition for Diversity and Inclusion in Scholarly Communications (C4DISC), a new organization with the goal of making our community more diverse, equal, and inclusive. This issue also includes an commentary by Jennifer Cox on the recent CSE White Paper Update from Editorial Policy Committee covering preprint servers; a guide by Dmitry Tychinin on helping non-native writers temper the “ad speak” in their articles; a tutorial on Interview Preparedness by Erin Nyren and Tom Lang on “How to Find and Interview for the Next Right Job”; and much more including an informative report from the 2019 European Meeting of the International Society for Medical Publication Professionals. I’d like to conclude this Viewpoint with a brief discussion of the star of this issue’s cover, the Red Admiral Butterfly (Vanessa atalanta). In an issue heavily focused on the work of CSE, I wanted to highlight on the cover an example of biological mutualism, wherein both biological partners (eg, butterfly and flower) are dependent on each other in a fashion that benefits them equally. (Hat tip to incoming CSE President Dana Compton who suggested this specific, and quite photogenic, relationship.) By coincidence, soon after selecting this cover image, I happened to be reading Pale Fire, by novelist and amateur lepidopterist Valdimir Nabokov, which features several references to the Red Admiral, including the following verse: “My dark Vanessa, crimson-barred, my blest / My Admirable butterfly…” The Red Admiral was originally known in English as the “Red Admirable,” which was Nabokov’s preferred name and a more poetic appellation, especially when the older definition of admirable, “to be wondered or marveled at,” is considered. Whether you are attending the CSE annual meeting or not, I encourage everyone to heed Beth’s advice: volunteer for a committee, network, meet people, and don’t be shy about asking advice. CSE thrives when you participate and help your fellow professionals and you will benefit in turn as you gain experience, make connections, develop new skills, and learn from others. Even the act of sticking your neck out to ask a question of a panelist or personally thank a helpful speaker is an admirable quality. So take a moment to marvel at and admire your fellow professionals, and know that you’re likely admired too.